LAS VEGAS, NV — One of the main criticisms about the Killer network controllers, either wireless or wired, is that they aren't Intel. The hardware isn't Intel, or the level of support isn't Intel. 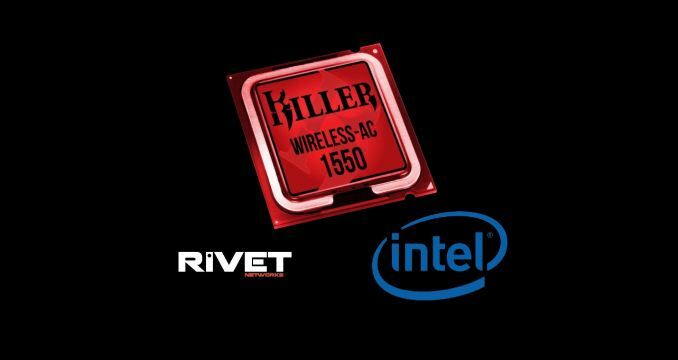 Today, Rivet Networks is announcing that its latest Wi-Fi chip, the Killer Wireless-AC 1550, is coming to market, and it is manufactured by Intel. Wait, What? Manufactured by Intel? To answer the obvious questions, let us start with a recap. The back story: In 2006, Bigfoot Networks introduced the Killer NIC – a PCIe card using a Freescale processor that promised to reduce network latency and lag. In 2011, Qualcomm bought the technology, putting it alongside on its own Atheros wired and wireless chips, but also reducing the cost and expanded the user base. In 2014, the technology was spun out to Rivet Networks, a new company formed by the CEO and CTO of Bigfoot, but still using Qualcomm’s manufacturing expertise and connections. The new story: In 2015, Intel discussed with Rivet to create a combined solution – the argument being that it would be better to collaborate than compete. Rivet was still ‘new’, managing the hardware post-Qualcomm, so initially nothing came of it. In 2016, Intel presented Rivet with defined roadmaps, and now with Killer across a fair amount of the industry (motherboards, Dell XPS, MSI), the partnership started. What happened from here is that Intel was to design and manufacture the chip. Rivet had a list of hardware requirements in order to be able to perform the features needed to perform Killer functionality, and Intel built these into the chip and gave Killer the required access to the silicon. Ultimately the chip would provide two different products: the Intel AC9260, and the Killer Wireless-AC 1550. With only one piece of silicon, only one set of regulatory approval was needed (which is expensive), and each company would sell the chip on its own, with company-specific features: Intel does its thing, while Rivet can enable their version with the features to make it a ‘Killer’ chip, such as packet prioritization, support for DoubleShot, etc. The end result is that the AC 1550 should have the stability of Intel (in fact, the AC9260 has been on sale for several months already), but the additional features of Killer. The driver for both is pretty much the same, being a combined effort between Intel and Killer, while the Killer version will have a specific version of the driver for Killer-features, as well as a Rivet designed service and OS application. At the high-level, the 1550 shares all the features of the AC9260. It is a 2x2 Wi-Fi module with full 802.11ac Wave 2 functionality for 160 MHz channels, including MU-MIMO, and with the right router is good for up to 1.73 Gbps peak throughput. It will be available similar to current Intel and Rivet wireless chips, available either as an M.2 module or as a 12x16mm BGA package, but also with CNVi support. Bluetooth 5.x is also supported. The additional Killer features brought to the table revolve around the prioritization software. As part of the evolution of the technology, the Killer chip can create six levels of priority, with level 1 taking the express freeway and being prioritized for low latency. The hardware supports a pre-prepared traffic whitelist, to which Rivet has already supplied it 1000 of the most commonly used applications and network traffic configurations (around 99.8% of all traffic, apparently). In the event that the app is not on its whitelist, users can put in their own options, or the controller can do Advanced Stream Detection. 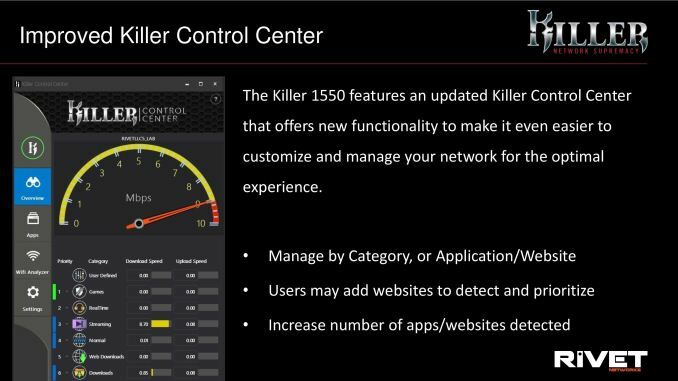 Killer’s Advanced Stream Detection looks at the way network traffic is constructed and processed to determine if it is a game, VOIP, a browser, streaming video, or a download. If a user imagines what sort of network traffic (and how it is processed), then the ability to detect this sort of thing makes sense, and doing it in a way that requires minimal CPU power is going to add value. Back at the office/data center, Killer run an automated nightly test of the 1000 commonly used applications in its whitelist to ensure that the software is still running correctly, as well as adding more to that list. In the event that a known application (such as a streaming service, or a game) changes the way the network runs and is thus no-longer detected properly, then the Killer engineers put it as high-priority for the next-day updates. I am told that this happens only a couple of times a month, or when a streaming service adjusts codecs. The 1550 also supports other Killer features, such as DoubleShot Pro (sending traffic down different pipes), Killer xTend (using the device as a switch), and has the updated Killer Control Center with updated rule sets and UX updates. The idea here is that even though this chip is manufactured by Intel, there should be no regression in features: this chip has everything the previous chips had, and more. Ultimately, all the physical IP in the chip is from Intel, with the stream detection algorithms and software stack being the proprietary part from Killer. Some of the hardware changes that Rivet requested might be used by Intel at a later date, or Intel might leave it for the Killer brand. 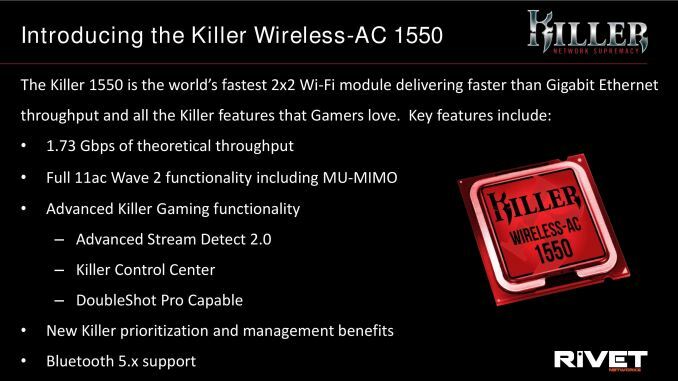 At the end of the day, each Killer Wireless-AC 1550 chip sold is an Intel sale anyway, and it would be interesting to compare the price competitiveness of the current Qualcomm-assisted chips and the new Intel-designed chips. One might have suspected that Qualcomm might have wanted to aggressively retain the Killer business to keep sales numbers, but we are told by Rivet that there were no particular issues from Qualcomm about Rivet partnering with Intel. The main complaints about previous Killer parts revolved around hardware, support, power, performance benefits, and functionality. With the 1550 being an Intel chip, some of those complaints automatically disappear. The 1550 is still likely to cost slightly more than the Intel AC9260, but Killer believes that the features provided justify the value-add and can offer partners product differentiation, especially with multi-taskers and streamers, two key markets that Intel wants to dominate. Today the announcement is a partnership for a single chip, although we suspect that given the discussion of Intel roadmaps, the two companies are likely to collaborate further for future products. 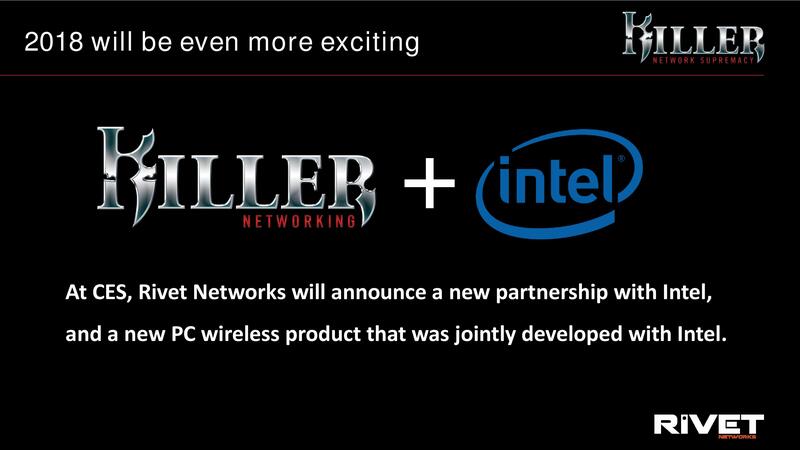 Launch partners are Alienware and MSI first, with the chip being put into devices launching in January. Select notebooks, desktops, and motherboards over the next few months will have the new chip. No word yet if it will be available as a standalone module at retail, or for what cost. You`ll get a different kind of answer when bad things on the market turn good. The only question that matters: If I find myself stuck with a laptop that includes one of these, can I install the plain Intel driver and expect it to work without any of the Killer nonsense?